When we started building the castle in my garden it was just a castle but whilst building it we have had such fun and decided that we really need to have a castle party, I suggest that it would be nice to have it while my brother will be here in July so that Lily’s cousins to could share the fun, it also gives me a deadline to have the castle finished and I respond well to deadlines. 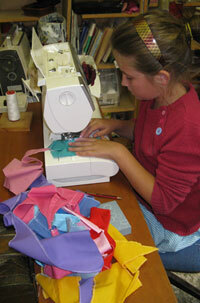 So party planning has begun…I am being guided by Lily as to what we need for a castle party, Pennants to decorate with are on her list and today we made Pennants…Lily went through my quilters cottons and pulled out the bright plain colours, I cut the shapes and then she zig zagged the edges and stitched a hem. 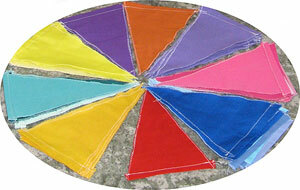 After they were all sitched and ironed she arranged them into a colour pie.